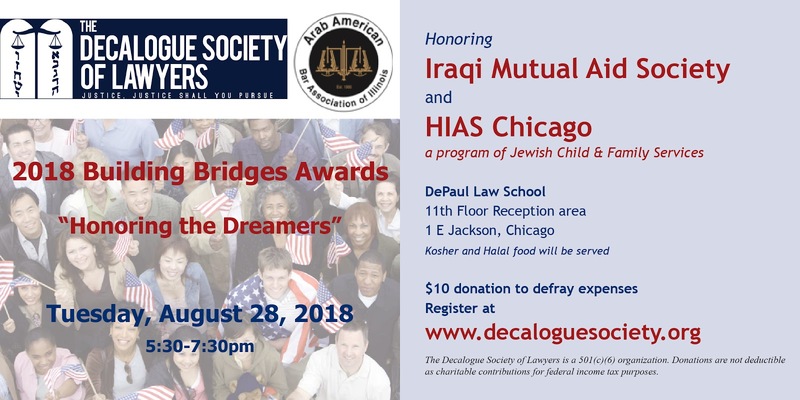 The Decalogue Society of Lawyers and Arab American Bar Association of Illinois will co-host the annual Building Bridges Awards on Tuesday, August 28, from 5:30 to 7:30 p.m., in the 11th floor reception area of the DePaul Law School. 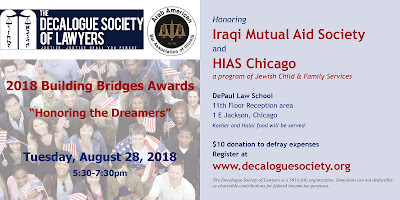 This year's honorees are the Iraqi Mutual Aid Society and HIAS Chicago, a program of Jewish Child & Family Services. The theme of this year's event is "Honoring the Dreamers." The Iraqi Mutual Aid Society (IMAS) is a Chicago-based, secular non-profit, founded in 2009, dedicated to providing long-term support services and building community for immigrants, asylees, and refugees. Although the organization's expertise is in assisting those from Iraq and the Middle East, IMAS doors are open to all immigrants, asylees, and refugees. The Hebrew Immigrant Aid Society of Chicago (HIAS Chicago) was founded over a century ago to support Eastern European Jewish immigrants. The organization's program has expanded over time to address the needs of various refugee and immigrant groups from around the world, regardless of religion, race or national origin. Today, it operates as a program of Jewish Child & Family Services. Tickets for the event are $10 each. Kosher and Halal food will be served. To register, visit this page of the Decalogue website. The Lawyers Assistance Program will hold its annual dinner on Thursday, November 1 at the Union League Club. A reception, beginning at 5:30, will precede the dinner, which is scheduled to begin at 6:30 p.m. Individual tickets for the dinner are $125 each; tables of 10 are available for $1,250. Sponsorships are also available (Bronze - $500, Silver - $1,000, Gold - $2,500). Tickets are available at this link. Chief Judge Timothy C. Evans announced yesterday that Judge Raul Vega will become Acting Presiding Judge of the Domestic Violence Division of the Cook County on Circuit Court on September 4. Judge Vega was elected a circuit judge in 2002; he was most recently retained in 2014. Vega has served in the Domestic Relations Division since June 2003. He has heard just about every type of domestic relations matter, such as divorces, child-custody disputes and requests for orders of protection, according to Judge Evans's press release. A 1982 graduate of Loyola Law School, Vega worked as a general practitioner in Chicago, handling civil litigation, including election, real estate, family, bankruptcy, federal taxation, criminal, probate and appellate matters, according to Judge Evans's office. Judge Vega did appear before Democratic slatemakers in 2015, when he was named a second alternate for an Appellate Court vacancy that never opened. As Presiding Judge, Vega will oversee the judges, administrative support staff and all court operations in the courthouse at 555 W. Harrison St. The Advocates Society of Polish American Lawyers will hold its Summer Reception and Awards Ceremony on Tuesday, August 28, beginning at 5:00 p.m. with a cocktail and appetizer reception at the Cerise Rooftop Bar, 203 North Wabash, 26th Floor. Cook County Circuit Court Judge Diann K. Marsalek, the Supervising Judge of the Traffic Division, and Associate Judge Mark J. Lopez, of the Domestic Relations Division, will receive awards from the Advocates celebrating their lives, legal careers, and respective contributions to the Polish community. Tickets for the event are $85 each, if purchased by August 25. Limited tickets may be available at the door, but will cost $100 each. Sponsorship opportunities are available. 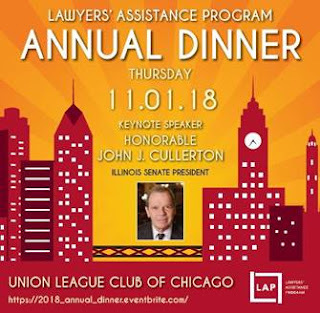 For more information about the event, to reserve tickets, or to explore sponsorship opportunities, call Advocates President Kristen Kozlowski Lyons at (773) 610-4175 or email her at attorneykristen@gmail.com. The Advocates are also co-sponsoring two August events with The Decalogue Society of Lawyers. First up, on Wednesday, August 8, from 5:30 to 7:30 p.m., is a social at Bar Louie, 333 N. Dearborn. Quoting now from this month's Decalogue News, "We will not rest until we have a relaxing informal social event at a local watering hole with every local bar association. Our last social with Black Women Lawyers' Association was a huge hit with all attendees. * * * Bar Louie will run individual tabs for everyone." Then, on Thursday, August 16, at noon, the Advocates and the Decalogue Society, in conjunction with the American Association of Jewish Lawyers and Jurists and the Chicago Loop Synagogue, will sponsor a talk by Michael Traison on the status of Poland, Law and the Jewish Community. The event will be held at the Chicago Loop Synagogue, 16 S. Clark Street. Tickets are $15 each and the cost includes lunch from the Sandwich Club. For more information, or to reserve tickets, email loopadmn@chiloopsyn.org . The ink is barely dry on the commissions of the latest class of Cook County Associate Judges and already applications are open for the next class. The above link will take you to the Illinois Courts website where you download an application to which you may affix a 'wet signature' -- which, for those who weren't with us last time, merely means a conventional signature, in ink, as opposed to an "e-signature" which must be affixed to the fillable online application. Persons choosing the fillable online application get, as a bonus, the opportunity to play a game of "beat the clock": Online applications, if not completed sooner, will expire after six hours and, according to the website, "information entered will not be saved." Associate judge applications are not kept "on file," so (as one person has already asked today) applicants from the last or prior applicant classes must complete a new application in order to be considered. For online applications, the deadline is August 31 at 11:59 p.m. Paper applications (with 'wet signatures') must be received in the Chicago office of the Administrative Office of the Illinois Courts prior to 5:00 p.m. on that same day, Friday, August 31. For non-lawyers who may happen across this post, there is nothing nefarious or suspicious about a new class of associate judges opening so soon after the last class was sworn in. This is an automatic process, triggered by the language of Supreme Court Rule 39(b)(1), which must be undertaken "as soon as practicable, but no later than 30 days after the accumulation of five consecutive vacancies for which notice has not been given." The notice signed today by Cook County Chief Judge Timothy C. Evans to the Administrative Office of the Illinois Courts advises that there are now six vacancies. There will, presumably, be more before the next class is sworn in. The Illinois Judges Foundation, the charitable arm of the Illinois Judges Association, will host its Annual Reception on Thursday, August 16, from 5:00 to 7:00 p.m. at the Kimpton Allegro Hotel, 171 West Randolph Street. Proceeds from this event support the charitable and educational programs of the Illinois Judges Association, and other charitable initiatives. New Supreme Court Justice P. Scott Neville, Jr. is among the persons slated to be honored at this reception. Other honorees are United States District Court Judge Rebecca Pallmeyer, Cook County Circuit; Cook County Circuit Court Judge Sebastian Patti, Presiding Judge of the Domestic Violence Division; and Lake County Associate Judge Luis Berrones. Tickets are $125 per person and may be obtained at this link online. Sponsorships are available. For more information, email ijf@chicagobar.org or call Christine Athanasoulis at (708) 705-4355. 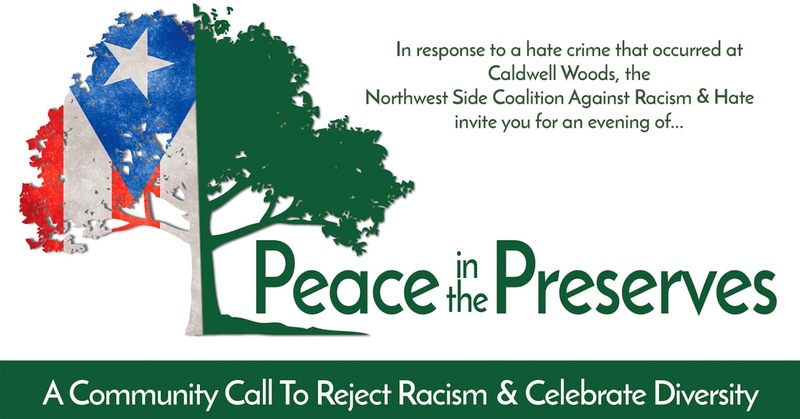 The Puerto Rican Bar Association is among the groups promoting and sponsoring "Peace in the Preserves," billed as a family-friendly event to promote peace and awareness -- the need for which was made apparent by the ugly incident that occurred at Caldwell Woods, on the Northwest Side, a few weeks ago. You've seen the video. 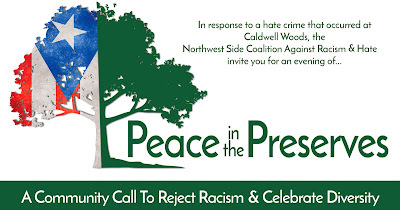 Hosting the event, set for this Friday, August 3, from 5:00 to 8:00 p.m., at the Caldwell Woods Pavilion, 6200 W. Devon, is the Northwest Side Coalition Against Racism & Hate. The Jesse White Tumblers will perform and the linked Coalition Facebook page says that music and other family activities (including face painting) will be provided. Attendees are asked to bring picnic dinners. No fee will be charged for attendance -- but donations will be solicited for a GoFundMe sponsored by the Puerto Rican Agenda of Chicago for Hurricane Maria relief efforts. For more information, or for last-minute sponsorship opportunities, email Claudia F. Badillo, the acting PRBA president, at Prba@prbalawil.com. Yes, I know there was no strike. The good folks in the Cook County Clerk of the Circuit Court's office did not engage in a job action. Transitions are tough. We are in a transition. But transitions are, by definition, transitory. We will come through this to the other side eventually. What will be there for us when we arrive? A bleak and desolate wasteland... or broad sunlit uplands?